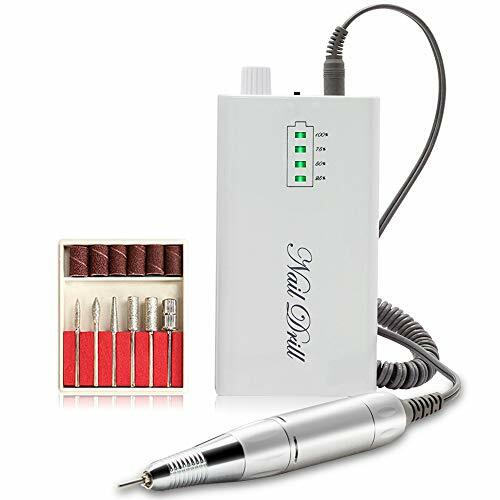 Professional Nail Drill Kit Get professional results at home with this 11 in 1 electric manicure set designed with 11 drill bits and 26 nylon wheels. 1 Pink Nail Drill, 1 Set of Nail Cutters, 1 Brush. The Ophanie Acrylic Nail Kit will meet all of your needs, whether at home or in the salon. 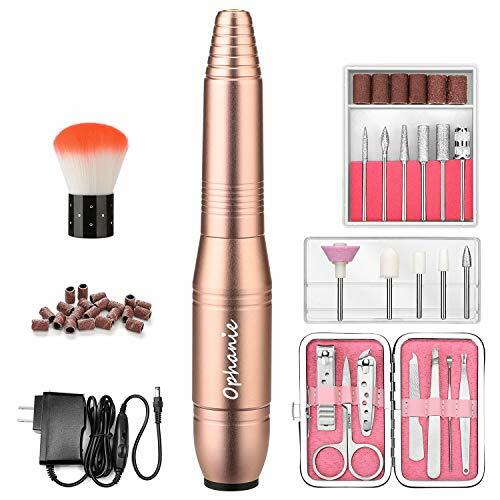 Easy to use Ophanie Nail Manicure Drill has FWD-Forward and REV-Reverse buttons to change the rotation so that you can get your nails just right. 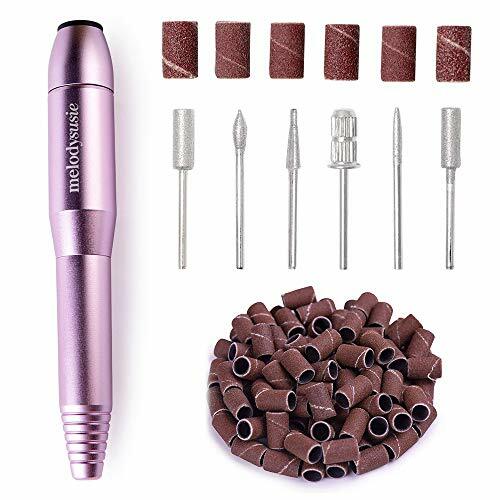 Multi-Functional Ophanie nail drill can be used for carving, polishing, shaping, engraving, cutting, mold grinding, sharpening, sanding, removing calluses, and it is even perfect for pet nail sanding! Portable Design Thanks to its small design, you can enjoy a nail salon at home or take it with you on your travels. Top Notch After-Sale Customer Service Ophanie offers a 2-year Return & Refund commitment plus a Lifetime Warranty on your nail drill. Please feel free to contact us if you have any problem with the product. We will be responsible for any product problem and assist you in finding a solution promptly. Step 2: Control the FORWARD/OFF/REVERSE button in the middle of the electrical cord to turn on/off. Step 3: Control the SPEED SWITCH in the middle of the electrical cord to adjust speed. Don't let the nail drill work constantly for a long time(no more than 20 minutes continuous). Don't rotation to open the body. Please remove the drill bit after use and store in a dry location. MULTI-USE: Made with high quality metal. Carving, Engraving, Routing, Grinding, Sharpening, Sanding, Polishing, even carving deep into the glass, without the drill or converter overheating. SPEED ADJUSTMENT: Being applied gel, acrylic, glass, natural nails or silk wrap artificial nails. LOW NOISE: It is quiet and smooth, very low vibration design for comfort grip. Low noise and vibration for smooth and long-time operation. NO BELLS AND WHISTLES: Drill bits and sanding bands allow you to get started immediately easy to use dialing speed control, never wavered. 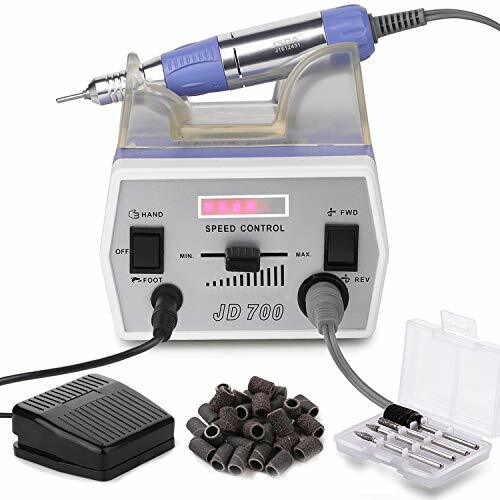 This new Electric Nail Art Drill Machine is perfectly used in spas, beauty parlors as well as personal use in homes. WARM TIP: TAKE A BREAK! Avoid overheating for continuous polishing in long time which may cause the machine got shock. Adjustable Speed and Easy to use: 0-20,000RPM with a speed control button, which makes this electric nail file easier and safer to polish your nails. Just need to connect the power cord with it to start working. It is professional for both home and salon use. 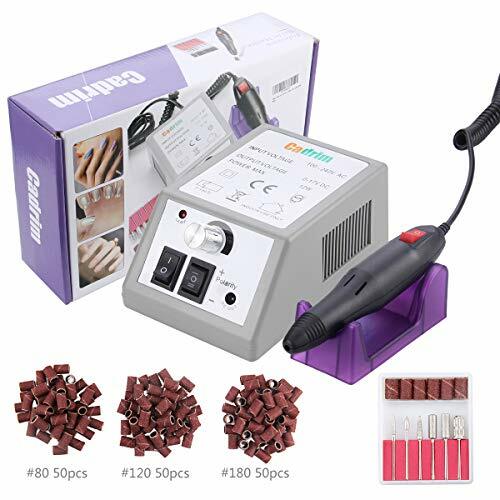 Multi-Function this electric nail drill can be used for grinding, cutting, carving, polishing even cuticle remover for all your nail manicure pedicure need at home or nails salon.3 nail brushes randon colors are attached to remove grinding dust&dirt after manicure pedicure. Low heat & Quiet & Smooth great aluminum body for efficient heat dissipation,good quality makes it extremely quiet and smooth with slight vibration when doing nail care. Direction & Speed Adjustable you can change the drill direction to forward or reserve manually with the two-way switch and adjust the drill speed from 0-20000rpm with the speed control knob. 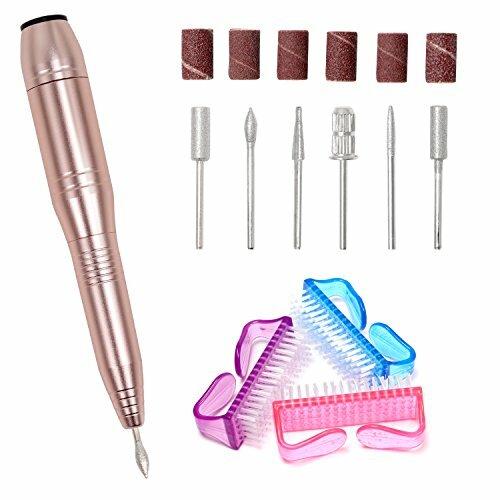 Protable & Artistic the nail file drill is pen-shaped & compact design,protable mini handpiece is easy to carry so you can enjoy nail art work any where at anytime. Brand and Quality Guarantee & Best Service One-Year Limited Warranty and Free Replacement Service.Please do not hesitate to contact us if you have any questions or concerns,we will gladly get back to you within 24 hours. Quality Assurance: All the customers can refund with no conditions within 1 months, NATPLUS Nail Drill Machine also provides 12-month warranty for quality problems and life-long maintenance services. Welcome to CONSULT all the product of us. Make sure your satisfaction. Will stop working if overload just turn off and turn on again Welcome! May you are always pretty. 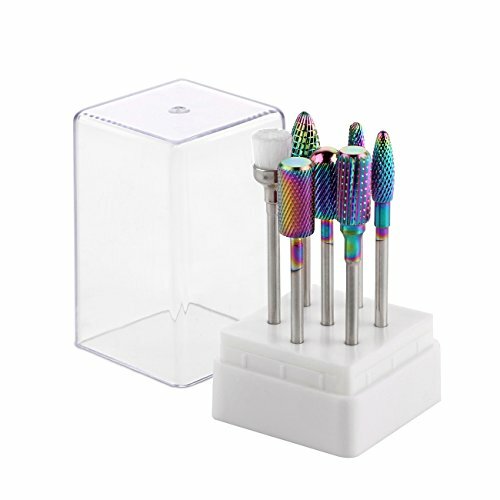 Makartt's Carbide Tungsten Steel Nail Set features 6 different tools and 1 brush so you can clean, sharpen, grind, neaten, carve, smoothen, polish and reshape gel nails, and stimulate nail growth. Looking after your nails is as important as grooming and making them beautiful. That's why the Makartt Tungsten CarbideNail Set features 7 different nail tools for care as well as beauty and pampering. No matter what you want - manicure, pedicure, cuticle trimming, and even carving under the nail - there is a tool for you. 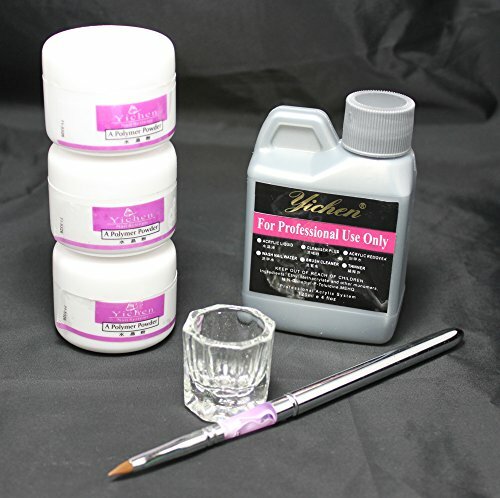 The set can even be used with gel and acrylic nails to smooth them out. following: sharpen extra thick or rough nails; grind nails or trim the cuticle; stimulate nail growth; remove dead skin; clean and neaten the cuticle or the underside of the nail; carve deep underneath the nail; polish and reshape gel and acrylic nails; and smoothen nail edges. For general nail care the set can be used to cut the cuticle, the sides of the nails, or to remove dirt from underneath the nail. The set has been specifically designed to protect the skin from being harmed and to give results that rival anything from a salon. Corrosion and heat resistant carbine material with long life durability ensure that each nail tool can work at peak performance. 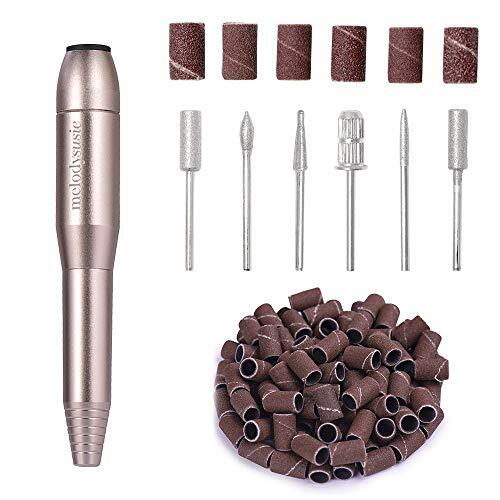 Superior Tungsten Carbide Nail Drill Bits Set- Made of carbide, the hardest material next to diamonds, makartt professional file drill bits are sturdy enough to remove hard gel nail, creating less dust with little friction and heat. Protects the skin from being harmed due to superior craftsmanship and well-tested design. 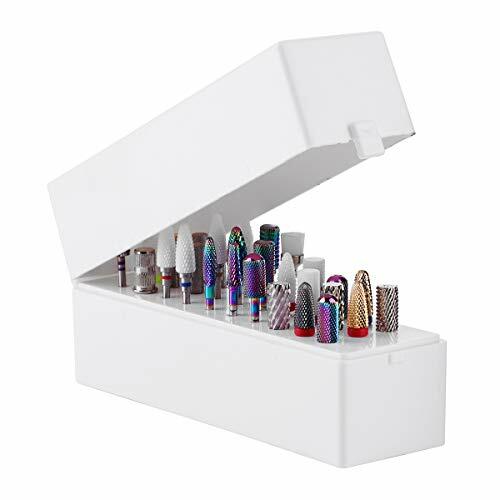 7 Bits Nail Set: Come with little cute case, compact and easy to store, this set included all the bits you needed. There are fine barrel bits, coarse barrel, safety bits, small cone bit, 2 UNC drill bits and cleaning brush.Suitable for most size 3/32 shank nail drill machine. Mufti Functions- This set can accomplish diversified professional jobs, such as carving, engraving, grinding, routing, sharpening, sanding, polishing, drilling and so on, suitable for natural nails as well as artificial nails, great tools for any professional manicurist or beginner. All the drill bits are smooth and don't heat up. Long-term used and saving your money. Suitable for most size 3/32 nail drill machine. Suitable for nail salon, beauty parlor, spa or personal manicure pedicure, DIY nail art at home.It is fun and happy to apply nails at home with friends and sisters. Our Makartt are trying to help our customer do their beauty nails at home. QUALITY GUARANTEE & PROFESSIONAL SERVICE -- We provide a tutorial video to assist you to use nail bits sets, so it's easy to use even for a nail beginner. For any Pre-sale and After-sales problems about Makartt products, please contact Makartt Professional Customer Service Team, we are always standing by for you. Please check description below to see what you are getting with this kit. Can be hung over on the waist for operation, can supply charging with phone,Ipad, tablet PC during handpiece working. CE Certificate High-Speed bearings :This Nail Drill Machine has approved the CE certificate. When adjusting the speed from 0-30000 RPM:(MIN to Max),it is quite enough, the grinding is extremely fast. Quality Assurance:Each one of Makartt Nail Drill Machine comes with 6-Month money back guarantee or return service without any reason. We also provide 12-month warranty for quality problems and life-long maintenance services. Easy operation: The electric nail file has the button of FWD-Forward REV-Reverse function to change direction, for handpiece please rotate it from the white middle part, then the drill bits will be opened and then press the button white middle part, it will close the hole and will hold the bits tightly. You are receiving an excellent high speed professional nail art drill. This high speed wired drill features an amazing lightweight hand piece with easy to use knob controls so you don't have to bother with a foot pedal. The sleek design will look great in any salon or home. Great entry level model will offer you MORE than you need to get started! 1.The actual max speed will be less than 20000RPM. Rotation: 0 rpm to 20,000 rpm Great for beginners, easy to operate, easy to carry when you are travel or in school. 1.Insert the hand piece flex plug into power output socket on the main control machine. 2.Select different drill bit's size according to actual requirements, and fasten/secure it into the front of the hand piece. 3.Connect with the main source power. 4.Choose the mode on the main control machine "+" (which means clockwise direction of the hand piece) or "-"(which means counterclockwise direction) and then switch to "On" position. 5.Choose the mode on the hand piece "ON" to start the machine. And choose mode "OFF" for a pause. 6.Select the speed level that you need by sliding the speed control knob. Please adjust the hand piece to the lowest speed before changing clockwise / counterclockwise direction. 7.After finishing, switch to "OFF" on the hand piece and switch to "OFF" on the main control machine and unplug it. Note: Always unplug the tool when you change accessory or collect. POWERFUL MOTOR&HIGH QUALITY : Built-in 20000rpm motor.Speed can be adjusted. Forward and Reverse operation. Plastic body takes it a efficient heat dissipation. Quiet, smooth and comfortable for long time operation. Contact the seller to solve the problem if any. Good Service : Contact seller to get help if any questions or problems. How to? Click the seller store name 'MPNETDEAL' and then click 'ask a question'm, so that you can state your problem and send to get help. ITEM INCLUDED : 1x Electric Nail Drill Machine,1xHand Piece, 1x Cradle for holding the hand piece,2 boxes of Drill Bits(36pcs), 56 pcs of sanding bands,10 x nail buffer file, 2 x White buffer Block, 1 x Instruction. Note:Different color product but using same color box. Item size: Fine Grit 3/32'' (Fits most nail drill machines that use 3/32" bits). Item weight: 60g /0.135Ibs. 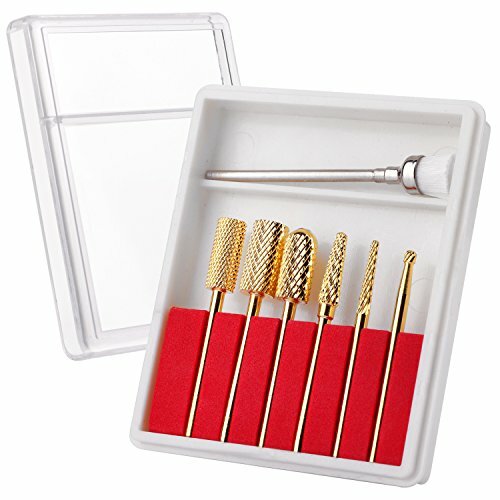 **Fashionable style- This set of nail drill bits are designed with gold color, heavy weight, vogue shapes, comfortable hand touch feeling, protecting skin and convenient to use. **High Quality- Made of carbide, the hardest material next to diamonds, these professional well-performed file drill bits are sturdy enough to use a cutting action to remove product, creating less dust with little friction and heat, Further, great quality makes the drill bits be long-term used, saving your money. 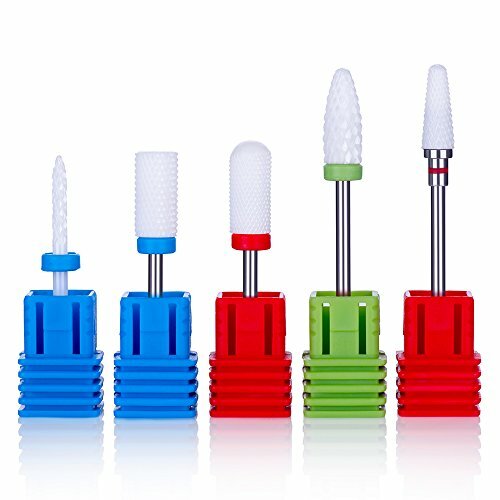 **Size and Quantity- There are 6 PCS different nice nail drill bits each set, which fits most nail drill machines that use 3/32 bits, can be used to get into tight areas such as sidewalls and cuticles. MelodySusie Nail Drill File in 30,000 RPM that allows you to "bring your beauty salon home" and do your own manicures like a pro. Functional, versatile, and quiet, it's an essential tool for nail-care veterans and newcomers alike. *High Speed with 30000RPM This professional nail drill is designed with Japanese high-quality bearing so it works smoothly with a high and adjustable RPM (0-30000 RPM ) but without vibration. It is an ideal file for both professional use in salon and beginner use at home. 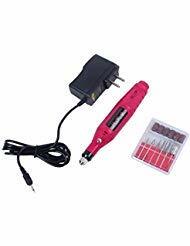 *Rechargeable and Cordless: With a large battery capacity, you can use this nail drill at anywhere on any time. Being charged for about 2.5 hours, the electric nail file can work lasts 6-8 hours. The smart LCD screen will show the RPM and electricity. Portable hook of the body case let you can hang it on your belt, waist, also can be packed into your traveling bag or case. *Light Weight and Low Heat: Designed with a high-quality aluminum alloy handpiece, Pencil designed handpiece is perfect for small hands and lightweight for extended use. *Multifunctional Use: This package comes with 6 kinds of metal bits (also works with all kinds of 3/32 shank bits) and 6 sanding bands, it works great on both natural and artificial nail for grinding, carving, cutting, polishing. *Easy to Use: This electric nail drill has the F-Forward and R-Reverse buttons to change the direction of the nail bit rotation, which enables any right-handed or left-handed use. It may pause 2 seconds to protect the motor when changing the options.MelodySusie offers a 6-month unlimited warranty from the purchase date. If encounter any problem while using our nail drill, kindly contact us first. CE Certificate High-Speed Bearings: This Electric Drill drill has approved the CE certificate; 0-30000rpm speed adjustable and support Forward/ Reverse direction, super FAST ; Give you a SAFE and the BEST EFFECTIVE nail art experience. Also a better choice for salon manicure!!! Rechargeable and Ultraportable: This Acrylic nail drill's Full recharge time ONLY 2.5 HOURS, continuous operate UP TO 8h( Four battery energy displays 25%, 50%, 75%, 100%, you can know the power situation in real time). The little size is even smaller than Iphone6 plus, it comes with the hook on the machine which could hang on your clothes, or put it in your pocket/ bag. Take it with friends to make nail art anywhere. More Efficient Of Operation: Professional quality makes the nail drill extremely quiet and smooth with a slight vibration; The chuck handle can be locked/unlocked, which is equivalent to insurance for high-speed rotating grinding head, more safety, and efficiency of operation. Perfect Customer Service: Nail Drill Machine also provides 12 months WARRANTY and 6 months FREE return or replace for quality problems; if you have any questions please contact me for free, customer service team will quickly reply within 10 times on weekdays. 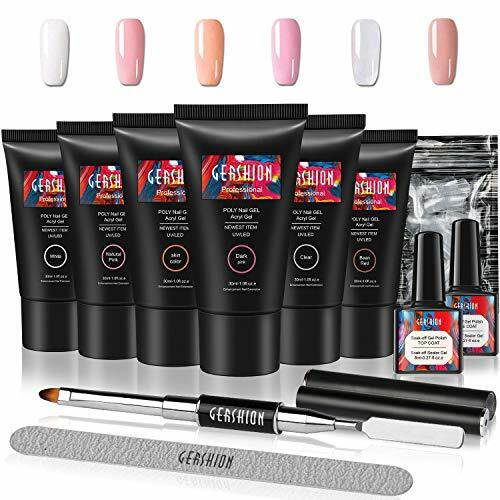 Premium Ceramic Material - Made of superior ceramic material, these nail art tools are hard-wearing and durable to use, with an excellent heat dissipation, the bits won't be burning hot during long-time use. Function - It is ideal for nail beautify, nail polishing, nail clear and care, peeling, etc., suitable for the manicure, pedicure use etc. 30pcs holes are enough to meet your basic needs. Made of safe, non-toxic, durable ABS material. 1. Pls allow a little size deviation due to the manual measurement. 2. Pls allow slight color difference due to monitor's brightness and contrast settings. (Not Inlcude Drill Bits)include 30 holes - can be used to store many nail drill bits, such as 3/32'' carbide drill bits, ceramic nail file bit. Acrylic cover - dust-proof to protect your nail drill bits. Space saver - Make nail drill bits look tidy and orderly. Sturdy Base - won't slip easily, can held your drill bits stably. Portable & mini - convenient to bring it outside for nail drill working. 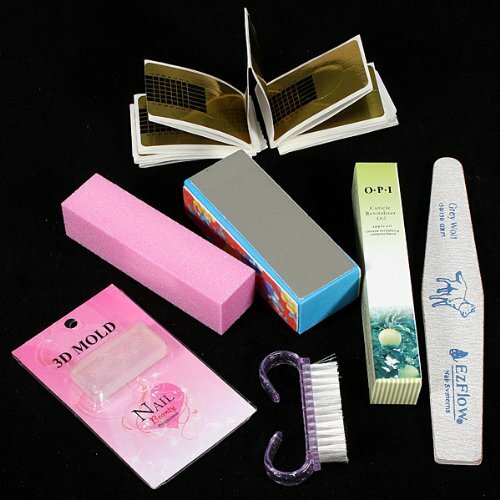 Sanding Band Set: One set with 3 pack sanding bands for nail drill with case that is helpful to store. There are 120pcs coarse grit 80#, 120pcs medium grit 120#, 120pcs fine grit 240#. 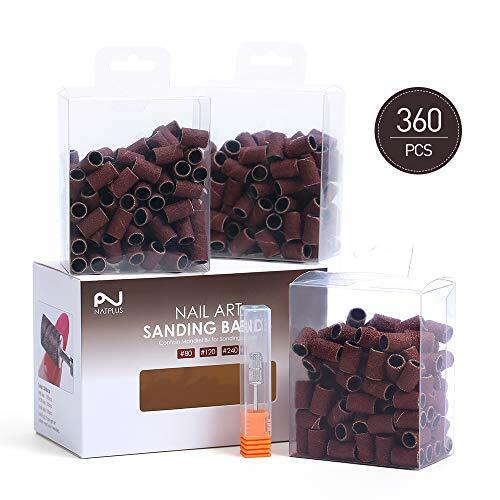 Nail Bands for Cuticle and Gel Remove: Sanding bands for nail drill 360 PCS large set could be used for a long time saving money. It is suitable for nail salon, manicure, pedicure and DIY nail art at home. Better Quality: NATPLUS nail sanding bands are designed durable with senior material via testing, which can ensure that it will not fall apart during using. Also it can be used on natural nail and artificial nail. Extensive Usage: Sanding bands set NATPLUS can help you a lot while doing nail art, such as carving, engraving, grinding, routing, sharpening, sanding, polishing, drilling and so on, which is a perfect item for manicurist and beginner. NATPLUS distinct Service: NATPLUS after-sale service, if you have any problem pls contract us, we offer replacement or refund service if you re not satisfied. If love our the nail bands, please leave your enjoyable experience via your words. MelodySusie Nail Drill File in 35,000 RPM that allows you to "bring your beauty salon home" and do your own manicures like a pro. Functional, versatile, and quiet, it's an essential tool for nail-care veterans and newcomers alike. CE Certificate, good quality adapter meets UL standard, makes it more safety and durable use. High-speed, low vibration, low noise and smooth operation with variable speed control (0-30,000 RPM ). 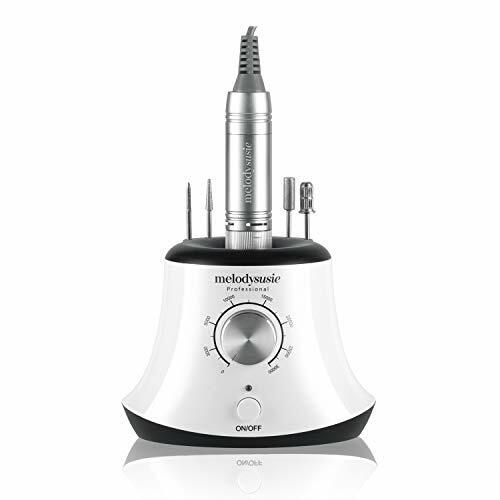 It is multi-functional for grinding, cutting, carving, removing gel polish and cuticles. 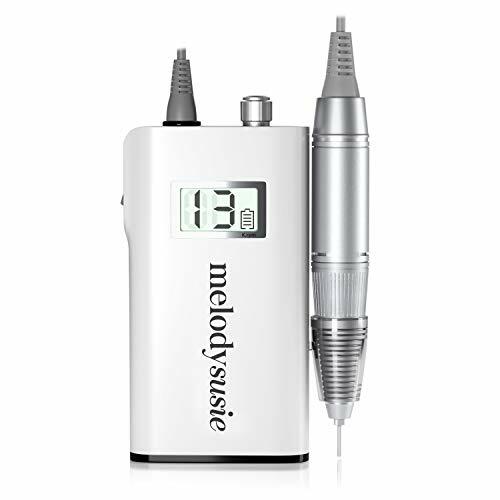 Designed with a high-quality aluminum alloy handpiece, it is lightweight and low heat for handling, suitable for both professional use in salon and beginner use at home. Humanized design with two modes and two directions: There areHand mode and Foot mode for you to choose and better meet your requirement. This electric file has the F-Forward and R-Reverse buttons to change the direction of the rotating bit, which enables any right-handed or left-handed use. It may pause 2 seconds to protect the motor when changing the options. Warranty: MelodySusie offers a 6-month warranty from the purchase date. If encounter any problem while using our nail drill, kindly contact us at first. Lightweight and portable size design, convenience to carry. Suitable for nail polishing use. PREMIUM NAIL ARM REST - made by soft & premium micro fiber leather material, touch more comfortable than PU leather and silicone hand pillow. MORE USEFUL - suitable for almost all of nail dryer and all of manicure bowl, save more room and place. EASY TO CLEAN - clean it with cloth is ok, environmental-friendly, health and sanitary. NEW STYLE - fashion style and look more beautiful, easy to use and portable. BEST GIFT - perfect for nail salon or at home use, wonderful gift for wife, girlfriend, female friends etc. Belle is specialized in designing and manufacturing top quality and newest manicure & pedicure products and have 8 Years of experience of nail beauty. To make Belle at Home is Bellehome's vision. High quality is our life. Every Belle new products before launching would be discussed and tested several times by our product design team to ensure good use experience for nail technicians or nail lovers. Bellehome encourages innovation and share. Welcome to share with any suggestions about Belle products by contacting us via email or social media. Your support is the greatest impetus for us. Thank you for choosing Belle. Wish Belle brighten your life! 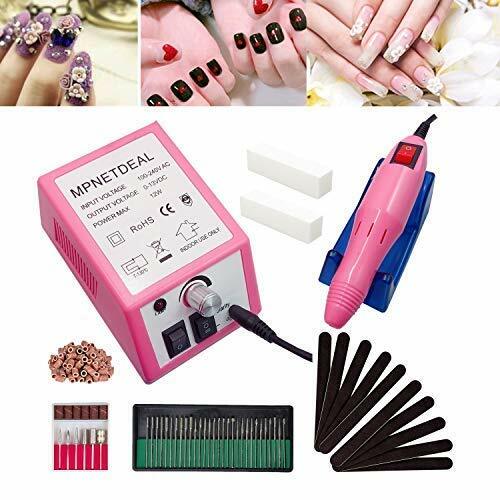 Rechargeable & Attractive look The world's 2019 first unique penshape nail drill can be used directly after about 1.5 hours full charged. Built in 700mAH big capacity battery can last about 1.5 hours. Popular elegant champagne gold color among the market. Portable with USB cable Light weight compact e file is perfect fit for your handbag. What's more, an USB port makes it more convenient to charge with a power bank or other charger block. Easy to operate It features direct Insertion Handpiece. Just LONG press ON/OFF button for at least 3s on the body to turn on and press one more second to change the direction. Press the speed button+&- on the body to adjust the speed. 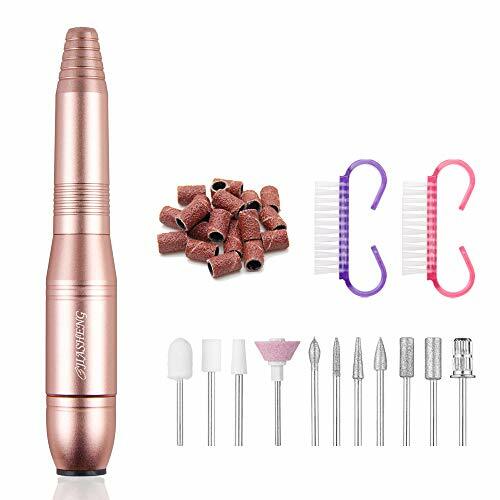 Quality assurance This portable nail drill is made of great aluminum body for efficient heat dissipation, good quality makes it extremely quiet and smooth with slight vibration when doing manicure. 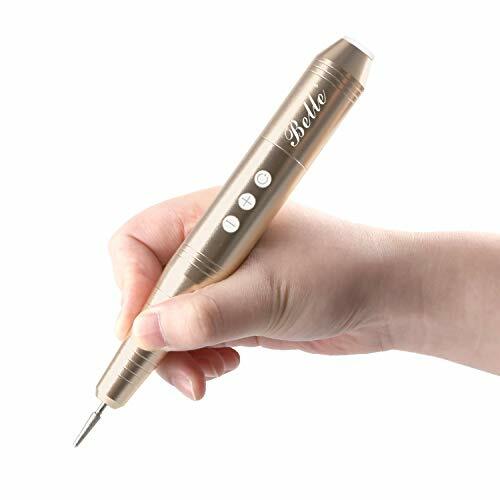 Wonderful gift This multi-use efile nail drill is really portable to allow you enjoy manicure at home, outside. Perfect gift for you, nail beginners & manicurists mothers, friends or families.